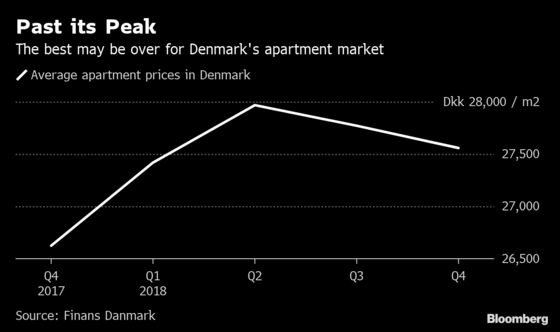 (Bloomberg) -- The “golden age” of double-digit growth is over for the Danish apartment market, according to Nykredit. Denmark’s biggest mortgage lender on Monday said the latest price data underlines a shift toward moderate gains -- or even contractions in some parts of the country. Apartment prices rose an annual 3.5 percent in 2018, according to Finans Danmark, but that growth rate was mostly due to gains posted in the first half of the year. That’s despite the fact that loans remain cheap in Denmark, where the benchmark interest rate has been negative for most of the last half-decade. Jyske Bank, the country’s second-largest listed lender, is now offering a callable note maturing in 2030 with a coupon of zero, a record low in the Danish mortgage market’s two-centuries-plus history. Cheap money will help prevent a “collapse” of the market, Nielsen said. She expects apartment prices to rise 0.2 percent nationwide and drop 1.9 percent in Copenhagen this year.